I love a flower crown. What could be happier than a crown made of flowers? Flower crowns are whimsical and summery and pretty. I know there are strong opinions and haters of flower crowns. (Click here for a funny take on haters.) The haters think flower crown people are "posers" and that they try too hard and that the flower crown fad is so over. Some people feel especially hateful about using fake flowers on the crowns. But guess what...people that wear flower crowns don't judge them back or worry about haters because we are too busy being happy wearing flower crowns that represent frivolity and joy and summer. 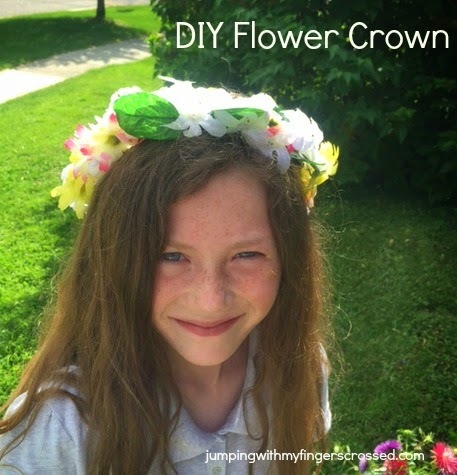 So if you are not a hater, read on my flower crown lovers because this week's Pinterest Poser Challenge* is how to make your own crown for only about $8. We rode our bikes over to the Dollar Store last Monday and bought some flower crown supplies. I spent about $8 on supplies. The first thing I did was measure Lucy's head and cut the vine to fit. Then I wrapped the vine with floral tape and then twisted the wire on top of that. I fired up my trusty glue fun and started placing flowers randomly everywhere. There was no pattern, I just filled it in all over. I'm super happy with how it turned out. This would be a fun craft to do with older kids this summer. Lucy and I hope to have a Summer Solstice party and give the crowns as favors to her friends. There are so many ways to have fun with the flower crowns! We added ribbon to the back for fun too. Last summer, we were on vacation and stumbled upon a small-town festival and everyone was wearing flower crowns and selling them. Since we were on a tight budget, I didn't shell out the $20 for a crown, but I tried them on. This year, I'm going to bring my own! Last summer's flower crown love. I'm not going to lie, I sort of dream of having a booth somewhere, or a lot of somewheres, throughout a summer that sells flower crowns and helps spread ideas of frivolity and joy. Ahhhhh, maybe someday. How do you feel about flower crowns? 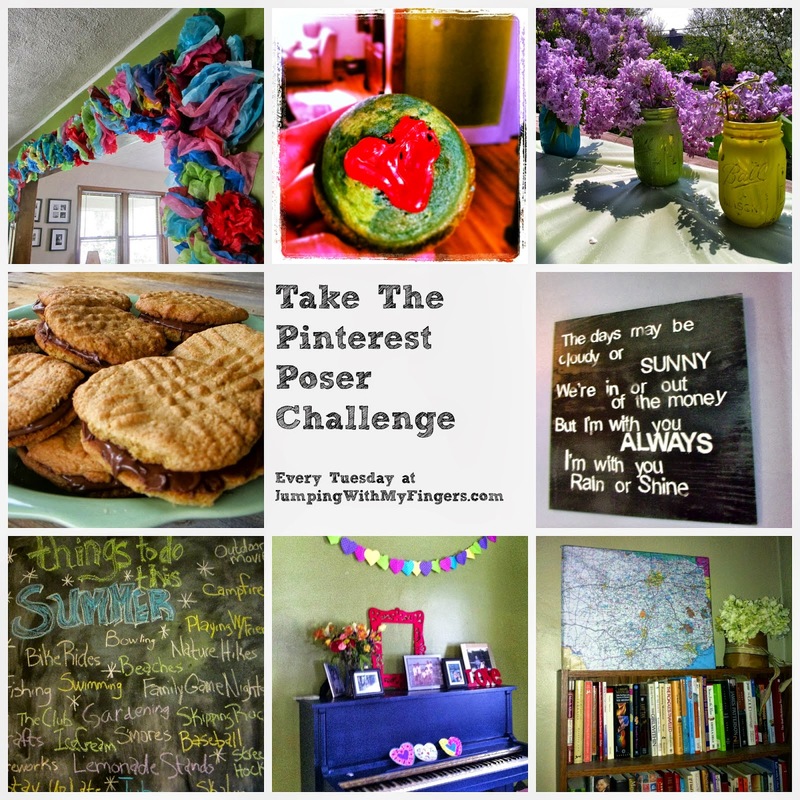 Have you made anything inspired by Pinterest lately? Let me know in the comments or over on my Facebook page. I didn't know flower crowns were a fad, let alone a fad that might be over. I do like them. Not sure I could pull off wearing them, but if I were at a summer festival, I'd certainly try. Who the hell hates flowers? Crowns? Flowers in your hair? I hope those haters stub their toe on a metal bed frame. I had a flower in my hair just a day ago. Then I forgot it was tucked behind my ear, and when I went to brush the hair out of my face I felt it and I didn't know what it was. A big bug? Probably a freaking cicada? I went into ninja fighting invisible air mode, but it was still gorgeous, dawling.